I hope our newsletter finds you well. I was happy to stop by the Neighborhood Council Budget Day event in the Valley last Saturday where folks gathered to talk the City budget. Many thanks to the Budget Advocates who were working citywide to do regional Budget Days for their community. Budget Advocate Glenn Bailey led the talks in the Valley with John Chavez from the Mayor's Budget and Innovation team discussing the City budget. Board of Neighborhood Commissioners President Leonard Shaffer and Commissioner Lydia Grant were there to support. Controller (and former Neighborhood Council Budget Advocate) Ron Galperin also stopped by to discuss his ControlPanel LA, which has an amazing amount of data on how the City spends its money including specific studies on the LADWP and domestic violence in Los Angeles. Much appreciation to the Neighborhood Council leaders who participated and to Councilmembers Nury Martinez and Filipe Fuentes for coordinating the meeting space and parking. If you haven't yet, please take the Budget Advocates City Service Report Card survey now and pass it on to your community members. It's a great way to provide feedback to the City on how it's doing in providing services from jobs to animals to streets. The Board of Neighborhood Commissioners met on Monday to continue their discussions on Neighborhood Council policy issues, including a new policy on meeting minutes. They will likely complete this policy in November so if you haven't provided feedback yet on this matter, please do so to Commission@empowerla.org. A reminder that the Commission's November 3rd meeting has been cancelled so their next meeting will be on Monday, November 16th, at City Hall. 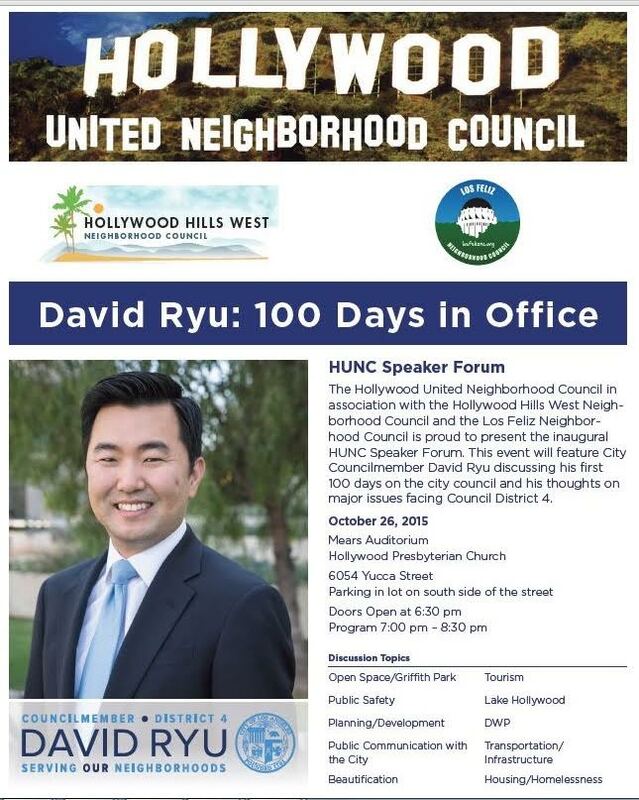 The Hollywood United, Hollywood Hills West and Los Feliz Neighborhood Councils are presenting the inaugural HUNC Speaker Forum featuring City Councilmember (and former Neighborhood Council leader) David Ryu on Monday, October 26th. Councilmember Ryu will be discussing his first 100 days on the City Council and his thoughts on major issues facing Council District 4, including tourism, public safety, planning development and housing/homelessness matters. It's great to see Neighborhood Councils and City Councilmembers partnering to discuss important community topics. I was excited to take a tour with our EmpowerLA outreach and elections team of ITA's LA Cityview 35. Station Manager, Ted Lin, gave us a tour of Channel 35's facilities, including the studio where our Neighborhood Council Advocate, Jasmine Elbarbary, showed off her skills as a television anchor. It looks like we'll have great opportunities to partner so we can highlight Neighborhood Councils awesome work and promote the Neighborhood Council elections. Much appreciation to Ted and his team for hosting us! We'll be having our next Election Town Hall tomorrow at 10 am in Glassell Park Community and Senior Center (3750 Verdugo Road 90065) where we'll work on finalizing the Election Manual and timelines. If I don't see you tomorrow, have a fantastic weekend!